We’d love your help. Let us know what’s wrong with this preview of A Fado for the River by Geoffrey Wells. 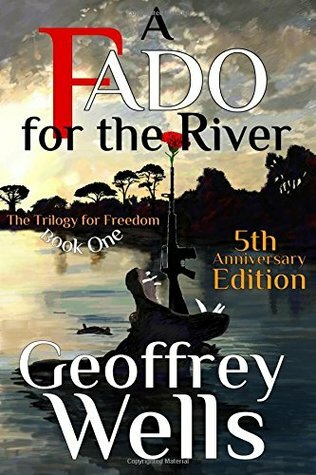 Published August 11th 2011 by Ice Wine Productions, Inc.
To ask other readers questions about A Fado for the River, please sign up. Impressions formed on a South African farm, boarding school, a father who read from the classics to his children, and a storytelling mother, sparked Geoffrey Wells with a writer’s imagination. Diverse interests of piano, playing drums, running track, observing elephants in Botswana and exploring Mozambique, gave Wells a framework for his first thriller, A FADO FOR THE RIVER. He found adventure cli Impressions formed on a South African farm, boarding school, a father who read from the classics to his children, and a storytelling mother, sparked Geoffrey Wells with a writer’s imagination. Diverse interests of piano, playing drums, running track, observing elephants in Botswana and exploring Mozambique, gave Wells a framework for his first thriller, A FADO FOR THE RIVER. He found adventure climbing the Drakensburg Mountains and in the cold desert nights while serving as a reluctant commando in the South African army. His career as Art Director in advertising lured him to commercials, and after immigrating to the U.S. in 1980, he studied at the American Film Institute, specializing in producing. He paid the rent working the graveyard room service shift at a Beverly Hills hotel, where he waited on some of the great and infamous actors and rock stars. The Internet and an ambidextrous brain led him to information technology, where, at Disney, he rose to VP for the ABC-TV stations and later joined Fox TV Stations as Chief Information Officer. Concurrent to his corporate life, Wells wrote, produced and edited an award-winning animated film, THE SHADOW OF DOUBT directed by his wife, Cynthia Wells, an animator and illustrator. The film showed in 27 film festivals and won five awards. He has also returned to Africa to visit elephant reserves, and climb to the tip of Kilimanjaro. Geoffrey Wells swims the open water off Long Island and runs a video and graphics studio. He writes about imperfect, vulnerable characters, who become empowered to fight criminals who destroy our natural and virtual ecosystems.